Palkia G Lv.X comes equipped with a nice 120 HP, a terrible Lightning weakness, disappointing lack of resistance, and a high but manageable two retreat cost. It also has access to the SP engine, which both helps with the retreat cost and makes it a much better card. Like all SP Pokémon, it is OHKOed by Machamp. 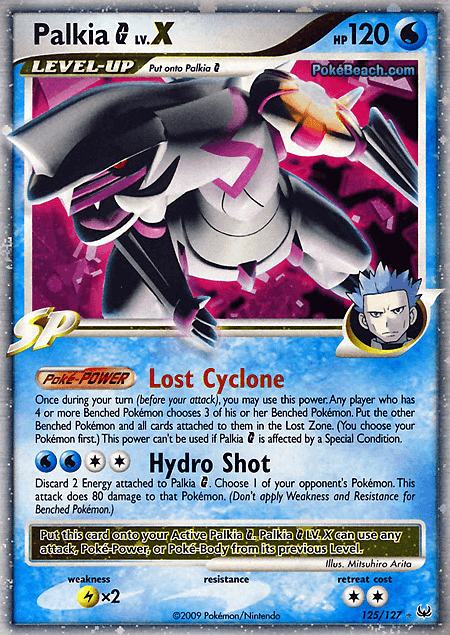 Palkia’s Poké-Power, “Lost Cyclone”, states that any player who has four or more benched Pokémon in play must send Pokémon to their Lost Zone until they have three. Obviously, this card combos amazingly well with put-into-play Poké-Powers such as Uxie, Azelf, Crobat G, and the aforementioned Mesprit. In addition to combining with a wide array of powerful cards, it also helps to disrupt your opponent by limiting their bench space. “Lost Cyclone” is also a method to make Seeker much less effective for your opponent. You use “Lost Cyclone”, they are forced to reduce their bench to three, oftentimes removing their Azelf/Uxie/Crobat from play and making it so Seeker cannot scoop up those cards. I’m aware it’s a bit circumstantial, but it is certainly something that should be noted as a countermeasure for Seeker, Super Scoop Up, or sometimes even hindering Power Spray’s usability. Pokemon ParadijsPalkia G Lv.X, being a Level Up Pokémon, has access to three attacks. “Splashing Turn”, doing 20 for WC, allows you to switch it with a benched Pokémon. While it won’t be used very often, it can help get Palkia out of the active position if needed. “Pearl Breath”, for WCC, does 50 damage along with 10 to each of their benched Pokémon. This attack will be used much more often than “Splashing Turn” as it can do higher damage. I will also note that not only can it abuse Energy Gain but also Double Colorless Energy. Perhaps Palkia’s best attack belongs to the Level Up. “Hydro Shot”, for the high cost of WWCC (also abuses Double Colorless), lets you do 80 damage to one of your opponent’s Pokémon. However, you must discard two Energy in order to use the attack. While it isn’t as fast or usable as “Dragon Rush”, I will note that, if you discard a DCE when you use the attack, you may use it again next turn so long as you can pay the cost, unlike Garchomp C Lv.X. If/when we see Lost World, I believe that Palkia Lock 2.0 will be a big threat that you’ll need to watch out for. It will be back like it was in 2006 and 2007 when Giant Stump was in the format; you always had to be careful about filling your bench. If you weren’t, it would cost you. I think this aspect is good for the game as it adds a new edge and I’m looking forward to it. My Recommendation: Palkia G Lv.X gained a good amount of power with the release of Seeker, so I will definitely be trying it out. If Lost World is released, you better believe that Palkia G Lv.X will be a powerful deck. …and we are all waiting to see whether it’s this Palkia, or the shiny Palkia, or some other Palkia that’s packaged in the “Clash of Legends” box. Anyone see that yet? Machamp, Back at the Top!